Godenvoice’s 2012 Coachella Festival this year is taking place on two consecutive weekends for the first time in its history. The first show is coming up this weekend, going from April 13 – 15. The second show takes place from April 20 – 22. Tickets for this festival went on sale for $285 (plus shipping/service charges and camping/shuttle fees) on January 13th and sold out in an amazing three hours. 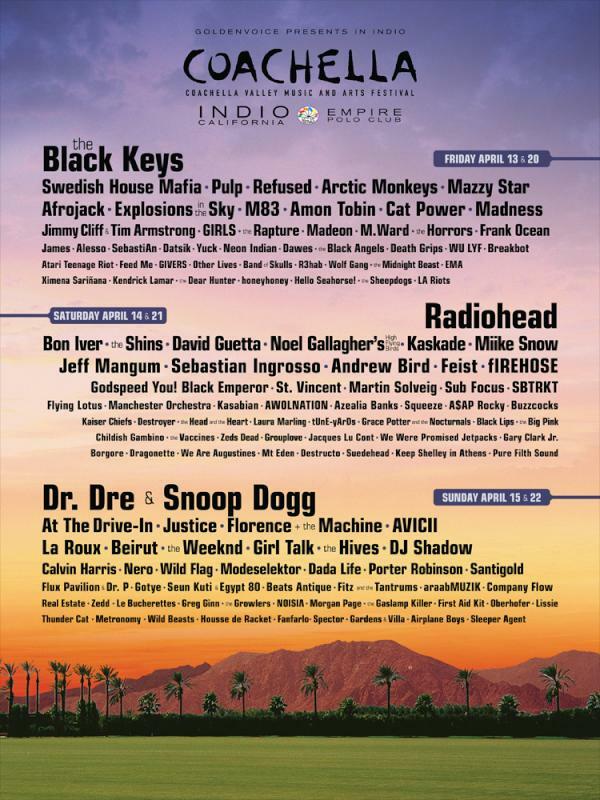 The lineup for this years Coachella Festival has some big names outside the EDM realm, such as Snoop Dogg and Dr. Dre, Radiohead, and The Black Keyes. But what we’re looking at are some of the big names in the EDM world that are performing there, include such huge names like Avicii, Alesso, Afrojack, Calvin Harris, Dada Life, Datsik, David Guetta, Flux Pavilion and Doctor P, Justice, Kaskade, Nero, Porter Robinson, R3hab, Sebastian Ingrosso, Swedish House Mafia, Sub Focus, Zedd, and Zeds Dead. Although Insomniac’s Electric Daisy Carnival and Ultra Music Festival are the two big names that draw the EDM crowd to their events, it looks like Coachella is trying to compete with the two biggest festivals in North America. If any of you guys are going, tell us how it was and share some pictures with us!